Captain a model sailboat in a series of races on the Lake (weather permitting, boats will be provided). Tickets are limited. Make the most of the one and only Central Park, choosing up to three activities. Cheer on your favorite sailor during our model sailboat regatta at the Conservatory Water. Take off your high heels and tour the Ramble with former NYC Parks Commissioner Adrian Benepe as your guide. Head over to the Lake and treat yourself to a ride in a wooden rowboat hand-made by Rocking the Boat students. I have read and agree to the Terms and Conditions and give my consent to Rocking the Boat to process my personal data. I understand I can revoke this consent at any time. Rocking the Boathouse is Rocking the Boat's new spring gala at the Loeb Boathouse in Central Park, a fitting location for South Bronx students and metropolitan area supporters to come together and celebrate their shared appreciation of boats, water, and nature. Funds raised will support Rocking the Boat's signature Boatbuilding, Environmental Science, and Sailing programs; wrap-around social work and college counseling; extended services for program alumni; and inspiring outdoor experiences for middle schoolers and the larger Hunts Point community. 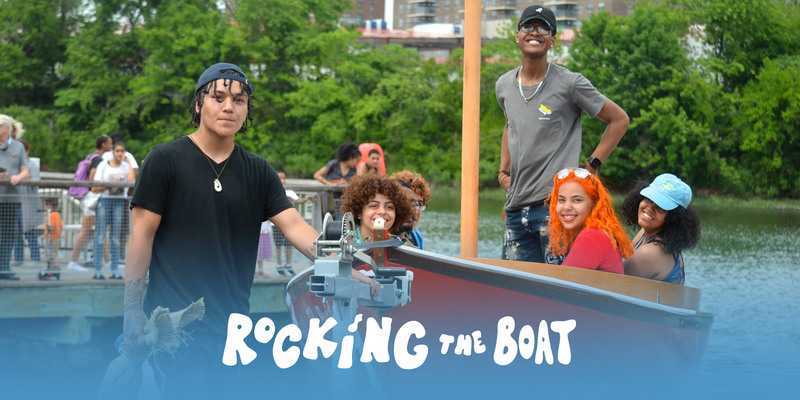 Recently marking its 20th anniversary, Rocking the Boat has developed a reputation as one of the most extraordinary programs of its kind in the nation, serving nearly 4,000 young people and community members.